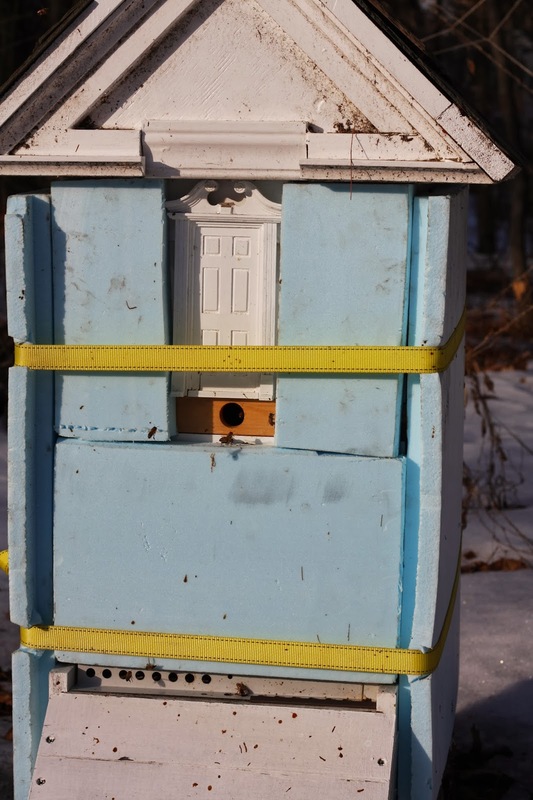 beehomesoon: Bees Out Flying in January! Bees Out Flying in January! Crazy January weather is continuing. I am not complaining, today was in the high 40's after a weekend that saw 56 degrees. The ice is gone off the slate roof and the sidewalks and today the bees decided to come outside for a while. So good to see after this polar vortex of below zero with unbelievable wind chills. 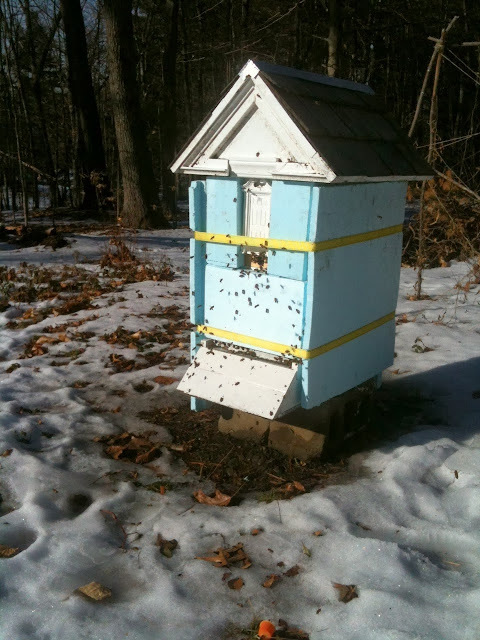 Look at all those beautiful and lively bees today--January 13, 2014. All out for a quick cleansing (pooping) flight in the 46 degree sunshine. I have been so concerned that they were so few in there, but this looks pretty good. Now I am hoping they can get along until spring really arrives. Look to the Instagram feeds on this page and you can see a video, and hear the buzz!! Ten minutes later. They've done what they wanted to do and all gone back inside. There's just one or two left out. They kept landing on my black parka to warm up, sweet bees. Did a little cleaning out of the dead bees off the bottom board. It doesn't look horrific, but they could still have a lot frozen in their tracks right in the comb. That's poop on the landing board. The chickens found some dirt that had thawed next to the compost bin. Happy dust bathing. The Welsummer hens are looking well and are laying quite well right now. Daisy, the Lavendar Americauna, was broody in December. Now she is back to daily laying, but I see that she is starting a molt. What is up with this crazy bird?! She is less than a year old. Pudge likes to crawl around on top of the chicken run. She is saying, "I am SOOOOOO glad for a day with no snow so I can climb trees and watch birds and sit up here in the sun. I am worn out from lounging on the bed and sitting in front of the fire all day."